Using a dial indicator, there is roughly a 1/32” difference from right to left on one side of the planer table. Nothing in this drawing seems to correlate with my 2030’s adjustment screws. I really just want to see how the screws on the bottom of the table actually raise or lower the four corners of the table, and once I can see that, well, it won’t take any genius to perform the adjustment. Can anybody offer any advice? -- A woodworker's skill is usually proportional to the number of clamps he possesses. Nothing in this drawing seems to correlate with my 2030 s adjustment screws. I really just want to see how the screws on the bottom of the table actually raise or lower the four corners of the table, and once I can see that, well, it won t take any genius to perform the adjustment. Yes, upon a closer look it’s clear that those screws move only the rollers. Based on another planer I own, I had the weird notion that there was an adjustment for the bed. I should mention that the outermost screws do bring the outer rollers to the recommended height. All four of the inner screws appear to have bottomed out before bringing the table to the desired height. 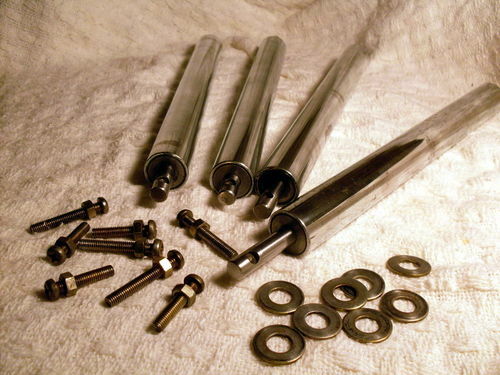 Now I’m wondering if the rollers were machined down in a prior life. The four outermost screws should be M6×30 (30mm in length), and the four innermost ones are M6×40 (40mm in length), so you can measure to make sure they are correct. 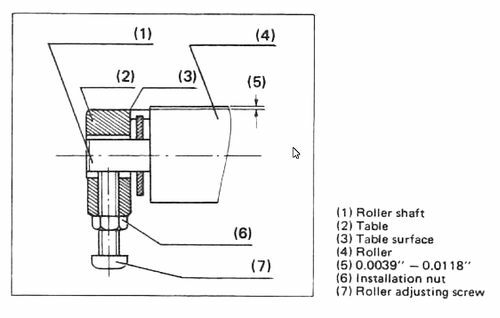 The rollers are set to just a gnats hair above the table as described in the manual, at 0.1 to 0.3 mm above. There should be plenty screw movement to get well above and below that amount. A-ha, that explains it. I never had these things out when I disassembled. So I’m guessing now that the indentations visible in your photo above are not lined up. Furthermore it’s highly unlikely that my machine still has the original screws. Tell me, when the screws are removed do the rods just pull out?